Protocol geeks may object, but I think it’s a fairly compelling argument, at least for explaining why what Creative Commons does is “big”. 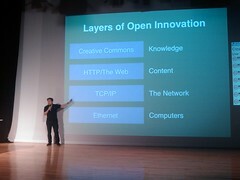 The problems of not having a top layer (I called it “content”, the slide photographed above says “knowledge” — what it calls “content” is usually called “application”, and the note above says “legal”, referring to one required mechanism for opening up permissions around content, knowledge, or whatever one wishs to call it) in which a commons can be taken for granted (ie like infrastructure) is evident, for example in the failure by lawsuit of most interesting online music services, or the inaccessibility of much of the scientific literature to most humans and machines (eg for data mining), as are powerful hints as to what is possible where it exists, for example the vast ecology enabled by Wikipedia’s openness such as DBpedia. I didn’t make that argument on-screen. Probably a good thing, given the previous paragraph’s tortured language. I shall practice. Critique welcome. 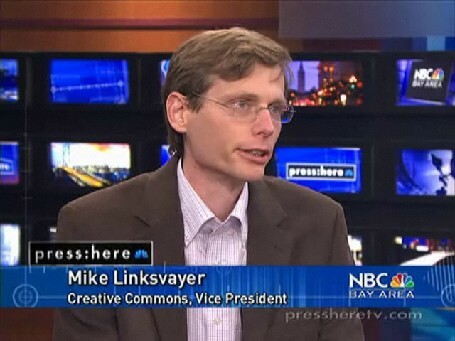 Press: Here is broadcast from its SF bay area home station (NBC) and I’ve heard is syndicated to many other stations. However, its website says nothing about how to view the program on TV, even on its home station. I even had a hard time finding any TV schedule on the NBC Bay Area website — a tiny link in the footer takes one to subpages for the station with lame schedule information syndicated from TV Guide. I found this near total disconnect between TV and the web a very odd, but then again, I don’t really care where the weird segment of the population that watches TV obtains schedule information. Press: Here ought to release its programs under a liberal CC license as soon as the show airs. Its own website gets very little traffic, many of the interviews would be relevant for uploading to Wikimedia Commons, and the ones that got used in Wikipedia would drive significant traffic back to the program website. Happy birthday identi.ca, home of honest microblogging.